The best tasting and most convenient way to help achieve your 5 to 9 daily servings of fruits and vegetables with our single serve packets of Green SuperFood! Box of 15 single serve packets of Green SuperFood. Add powder to water, juice or a smoothie. Kidz SuperFood All Natural Chocolate Drink Powder, 6.5 oz The SuperFood Children's Supplement has 33 fruits and vegetables with a healthy scoop of cocoa to bring a new and tasty way for kids to get the anti-oxidant power of 3 servings of fruits and vegetables in one glass. Spirulina, 100 caps Nature's Way Spirulina Algae Supplement is specifically useful for those on a weight control program and as a mild appetite suppressant that helps control dietary cravings. Lycopene Super Antioxidant, Lycopene Supplement, Nature's Way, 5 mg - 60 Softgels Nature's Way Lycopene Supplement provides food nutrients from organic tomatoes. Cellfood Natural Weight Loss Formula, 4 fl oz., 4 fl oz Cellfood Natural Weight Loss Formula, with amino acids, electrolytes, digestive enzymes, and minerals helps regulate metabolism and breakdown organic material, while increasing your fat burning potential... even while you sleep! Organic Wheat Grass tablets, 1000 mg- 200 tab Easy to swallow coated organic wheat grass tablets. Wheat Grass Powder Single Serving Packets - 15 Packets Single serve Wheat Grass Powder packets. Easy mixing fine ground wheat grass, box of 15 packets. 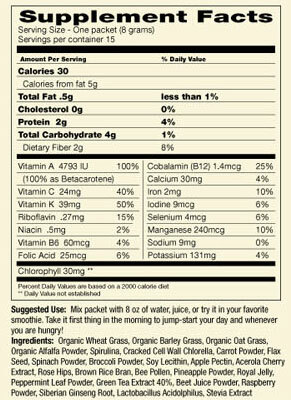 Barley Grass, 9 oz Nature's Way Barely Grass powder had no additives or dilutents and is gluten free.